Remove and discard skin from all chicken pieces except wings. Add all chicken pieces to large resealable plastic bag; place in large bowl. Bring 2 cups water, lemon peel, salt, garlic and herbs to boil in saucepan. Remove from heat; pour into separate large bowl. Add remaining water, dressing and ice; stir until ice is melted. Pour over chicken; seal bag. Refrigerate overnight. Remove chicken from dressing mixture; discard dressing mixture. Pat chicken dry with paper towels. Let stand at room temperature 20 min. Meanwhile, heat greased grill to medium-high heat. 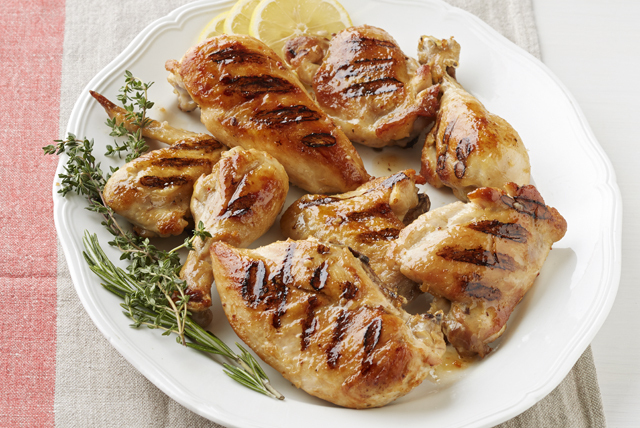 Chicken can be refrigerated in the brine up to 24 hours before grilling as directed. The grilling time needed for the chicken will vary with the parts: the wings will take about 12 to 15 min. to cook, the thighs and drumsticks will take about 15 to 17 min., and the breasts will take about 18 to 22 min. The easiest way to ensure that cooked poultry is done is to check the internal temperature. Using an accurate food thermometer will take away the guesswork. Simply insert the thermometer into the thickest part of the poultry, avoiding any bones if present. For whole poultry, insert the thermometer into the thickest part of one of the thighs, again taking care to avoid any bones. Thyme and rosemary stems are woody and undesirable to eat. To remove the leaves in one quick motion, hold the top of the stem in one hand and strip off the leaves with the fingertips of your other hand. The stems do have flavor and can be added to roasted foods, but remove them before serving. Or, try adding the stems to hot coals before grilling to add extra flavor to grilled food.